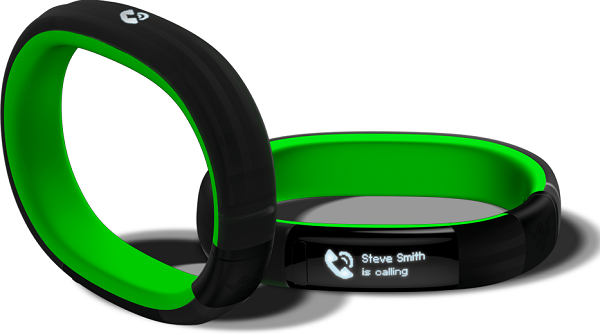 Razer has announced the Nabu, a device that appears to be a cross between a fitness band and a smartwatch. It contains the same kind of notifications that are found watches like the Samsung Galaxy Gear and Sony Smartwatch 2, but all contained on a display that looks like the Nike Fuelband. It also resembles Nike’s fitness band, which makes figuring out just what this is for a little bit harder. Nabu is fitted with two tiny OLED displays, one on the top for public notifications and one underneath for reading private messages. Like most smartwatches, it is also fitted with gesture controls to allow the wearer to dismiss calls with a shake of the wrist. Razer’s press site says that this feature is programmable and will allow users to customise their gestures. Of course, the catch is that neither of the displays is large enough to allow anyone to comfortably read messages on the device. The larger display is only 128 x 32 pixels. Naturally, as a gaming company Razer also tries to gamify the experience of wearing the band by awarding points badges, points, and achievements for doing things like walking or sleeping early. Razer is also developing a fitness app to go along with the smartwatch. It isn’t a new idea though, virtual rewards for exercise originally appeared in the MMORPG Fitocracy; a game that gave characters experience points for hitting the gym. Social networking applications are also included with Nabu as it automatically searches out other Nabu devices in the area and notifies you of their presence if those people are within your social networking circles. In other words, there will be no hiding from that Facebook friend who you just don’t want to see. It will apparently also allow people to exchange LinkedIn profiles through a handshake by recognising the gesture. There is no price for this strange device that is trying to do it all, although it wouldn’t be too difficult to imagine Razer’s usual premium pricing being attached. However, developers can take advantage of the Nabu Developer Program and buy the band for only US$49.